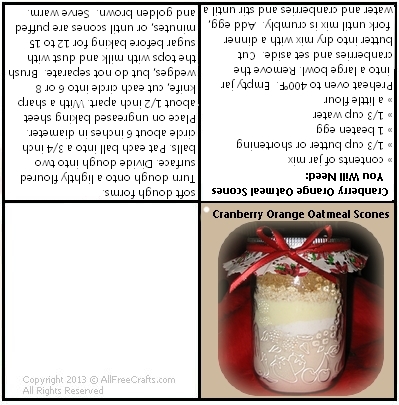 Light and flavorful, yet not overly sweet, this healthy cranberry orange oatmeal scones mix is both easy to assemble in a jar and simple to prepare for baking. Eat warm from the oven , topped with fresh butter, to best enjoy the tender crisp crust and soft, fluffy inside texture. I’ve been trying to eat more cranberries lately, because they are one of those super foods packed with nutrients and antioxidants. I also like to eat oatmeal at least once a day for its cholesterol lowering properties. 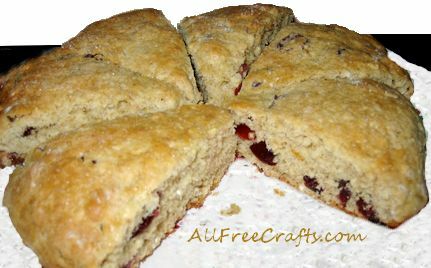 As a result, my family and I have tried several versions of cranberry oatmeal scones. This recipe is one that I came up which offers an appealing hint of orange with tangy, sweet cranberries, along with a traditional home-baked scone texture. Guests seem to like them too, so they are a keeper for me. Here’s the recipe, designed to fit a two-cup jar to maximum capacity. 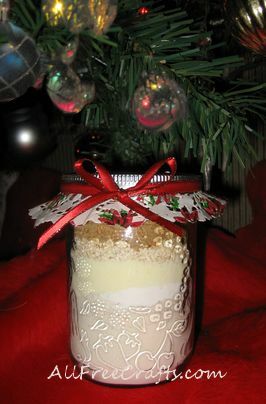 Layer the ingredients, in the order given, in a two cup jar. Use the bottom of a glass or plastic cup, just small enough to fit inside the jar, to press down and firmly compress each layer. You’ll find that by the time you come to the top layer of cranberries, there won’t be too much room left. Pack as many cranberries into the remaining space as you can. By pressing down on them with the bottom of a measuring cup, I was able to get just about a cup of cranberries into the top of the jar shown here. Empty jar into a large bowl. Remove cranberries and set aside. Cut butter into dry mix with a large dinner fork until mix is soft and crumbly. Add beaten egg, water and cranberries and stir until a soft dough is formed. Turn dough out onto a lightly floured surface. Divide dough into two pieces and form each piece into a ball. Pat each dough ball into a 3/4 inch circle about six inches in diameter. Place both circles on an ungreased baking sheet about 1/2 inch apart. With a sharp knife, cut each circle into six or eight wedges, but do not separate them. Brush the tops with milk and dust with sugar before baking for 12 to 15 minutes, or until scones are puffed and golden brown.